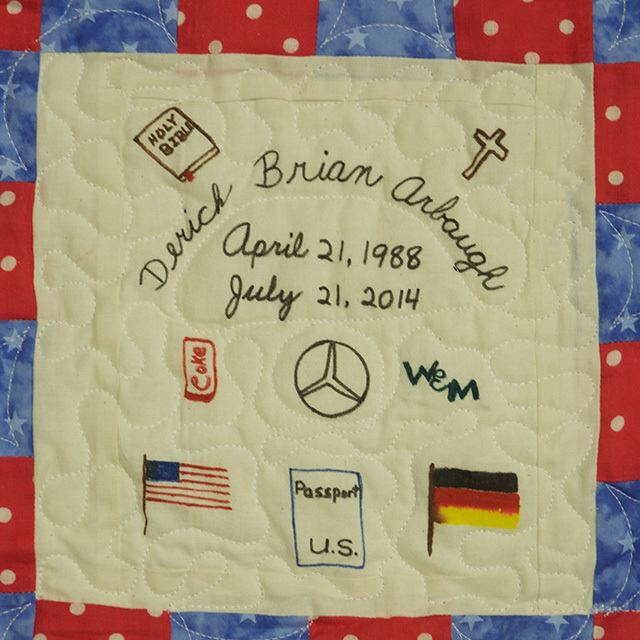 Legacy of Hope’s Family Quilts are a patchwork of memories, lovingly created primarily by donor family members. 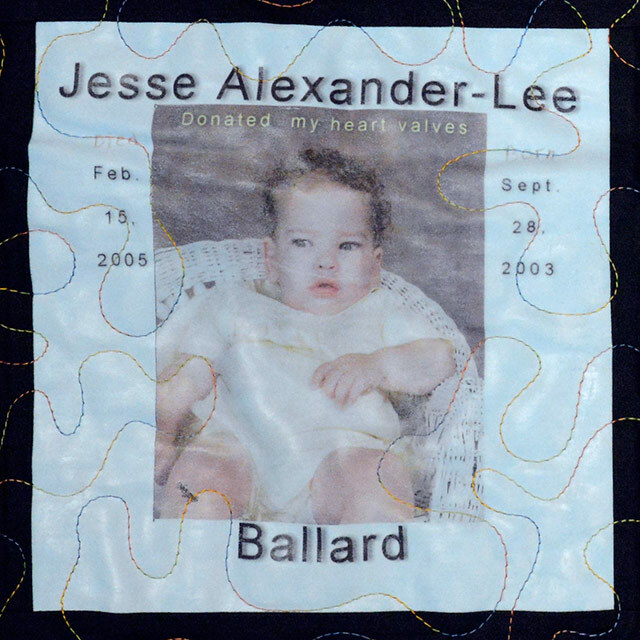 Each original quilt square is used to make one of dozens of donor family quilts displayed at events and memorials statewide to spread the message about organ and tissue donation. 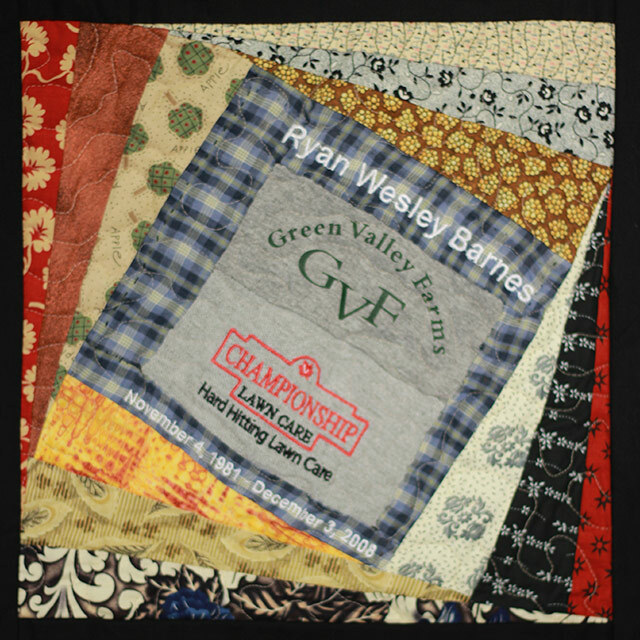 You may access the individual squares and read their stories by clicking below. 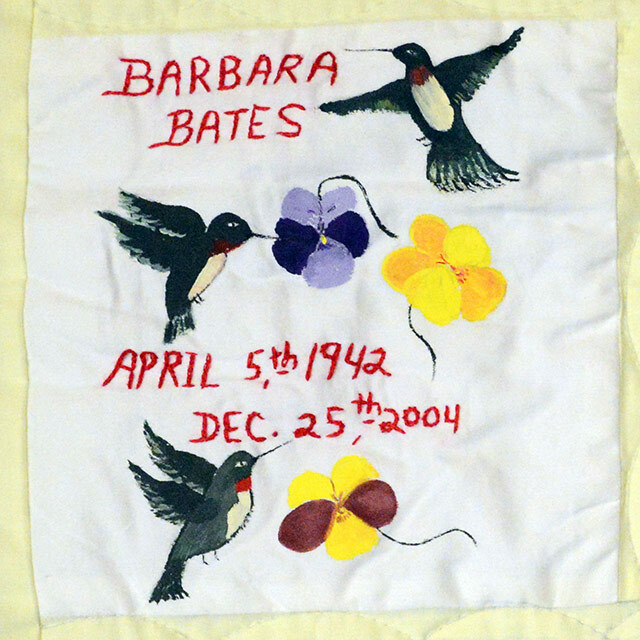 The quilt is an ongoing project and will never be finished. 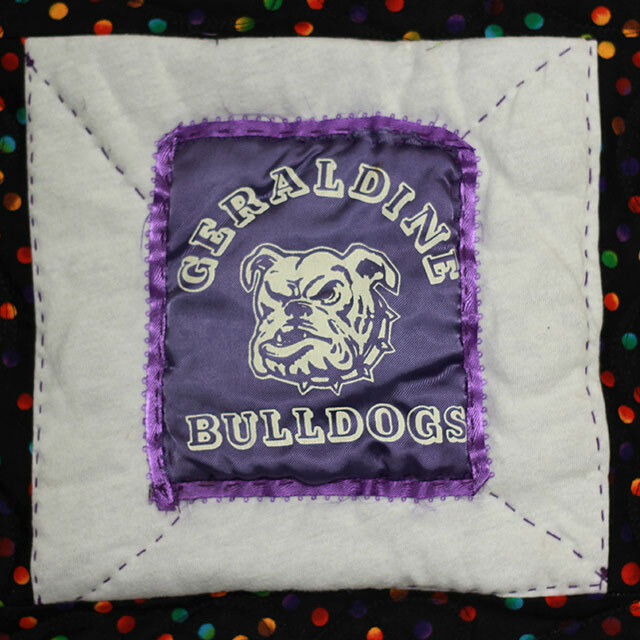 If you are interested in submitting a square please follow these directions, “How To Make A Quilt Square.” If you are interested in submitting a story for a previously submitted quilt square, please e-mail our Aftercare Department. Please allow a moment for the quilt to load. Hi! I’m Debbie, Chris’s mom. 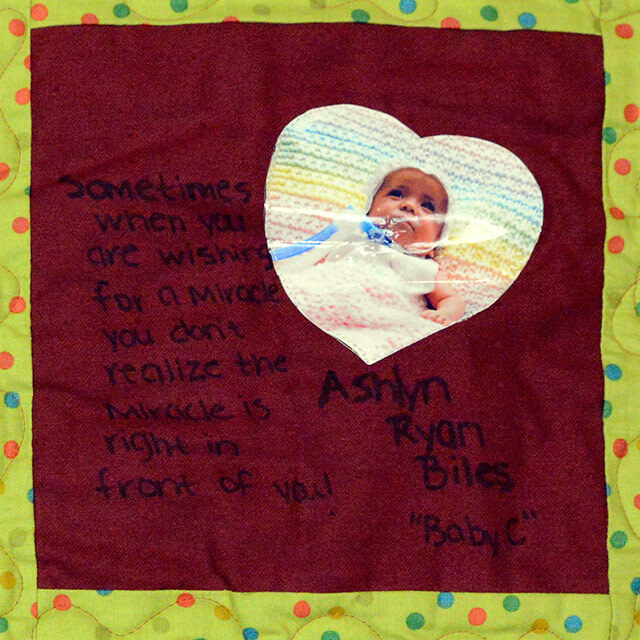 First, I would like to thank each and every one of you for making this blanket and may God bless each and every one of you. Now I would like to tell you a little about Chris. 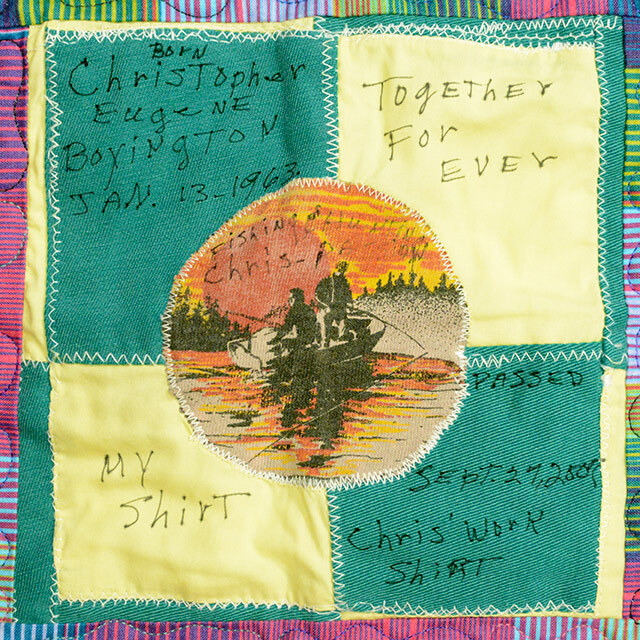 Chris was the kind of person who would give the shirt off his back if he had to. He loved to help people who needed help. He loved to cut grass, swim, play baseball and he loved to go fishing, and he especially loved to go to work with his Daddy, David. Chris also loved going to spend the night with his Maw Maw Reaves. And when it came to holidays, he loved spending it with his family, especially his Daddy and Maw Maw. 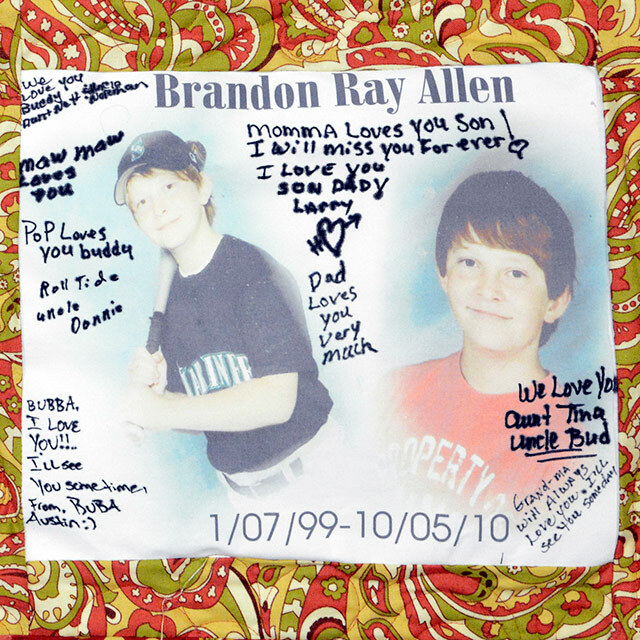 He loved doing things with his brother Marcus, especially playing card games and board games. He really loved getting out and riding his brother’s scooter with him. He had a trampoline and loved jumping on that! Chris loved going to church with his Maw Maw Reaves. Chris knew his bible, that’s one thing I’m sure of. Chris was the type of person who could make you mad, but you loved him at the same time. His best friend was named Nicholas, they had lockers near each other at school. Before the accident, Chris had asked God to forgive him for all the bad things he had done and help him to be good. 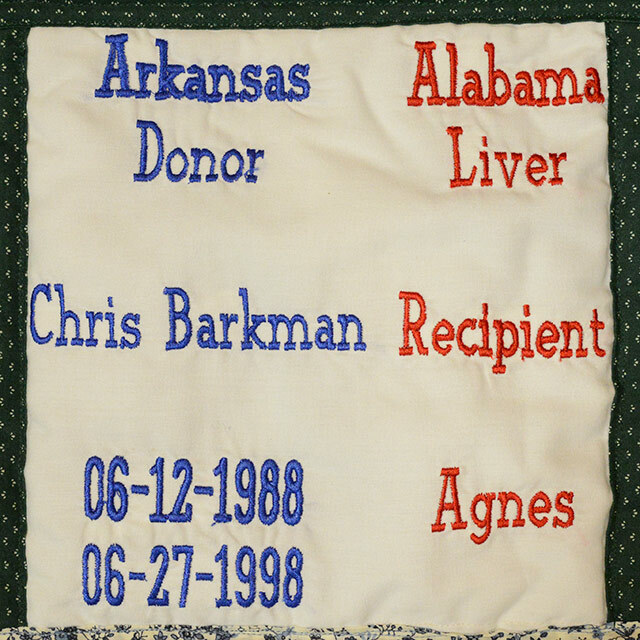 Chris saved four women’s lives as an organ donor. I thank God that Chris saved others. I know he’s still living within them and that’s one of the most precious gifts. The gift of life is to give life to someone else. I was told by my mom that Chris had told her that he wanted to be a donor because his mom was (me). 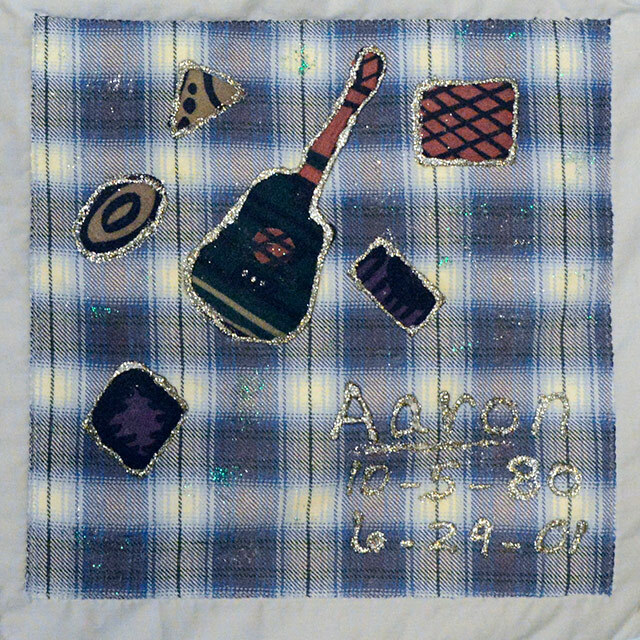 Aaron was our precious son and grandson. He was born 10/5/1980. 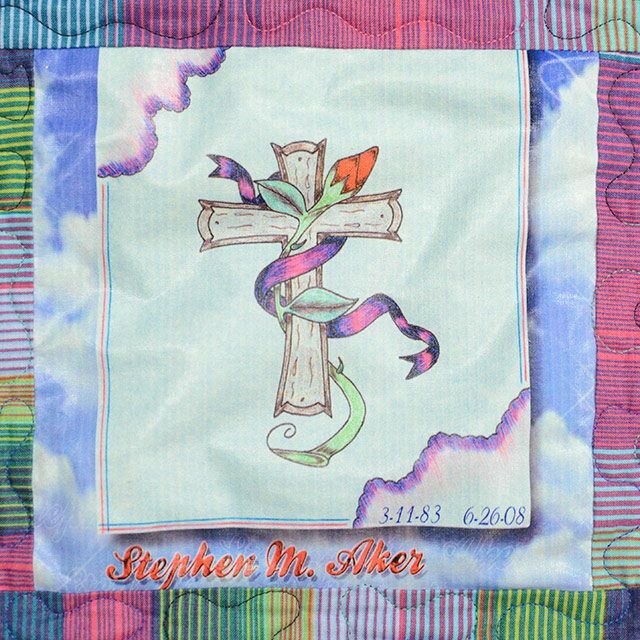 He passed away 6/29/2001. We all loved him so dearly. He died from smoke inhalation. 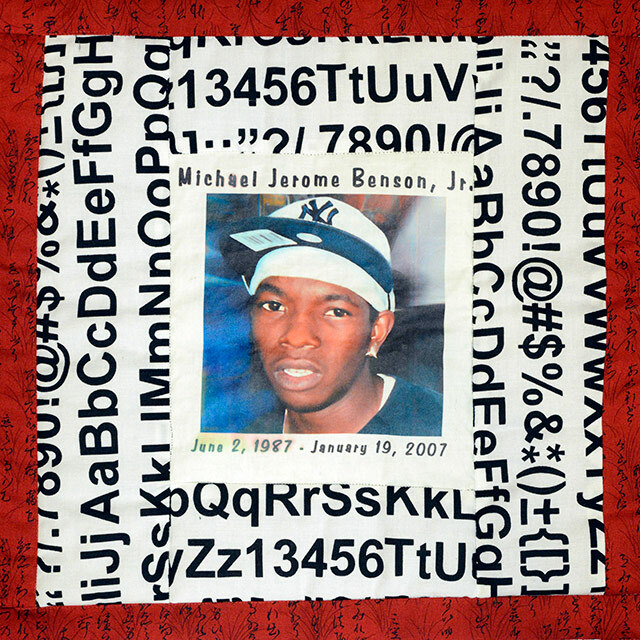 This quilt patch is a part of one of his shirts. Aaron was a special person, he loved people, loved life. So compassionate. He liked music, liked to play music. He wrote such great poetry. 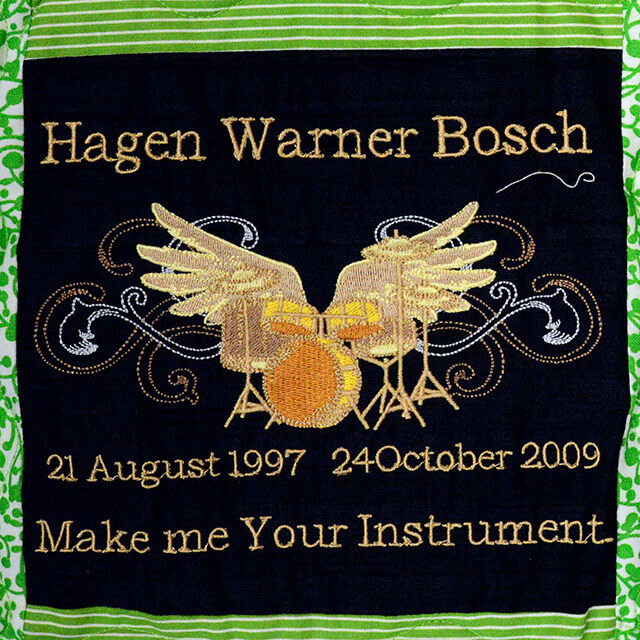 We never had discussed organ donation, but we thought this would be what he would have wanted to do. So we feel part of Aaron is still living through someone else. 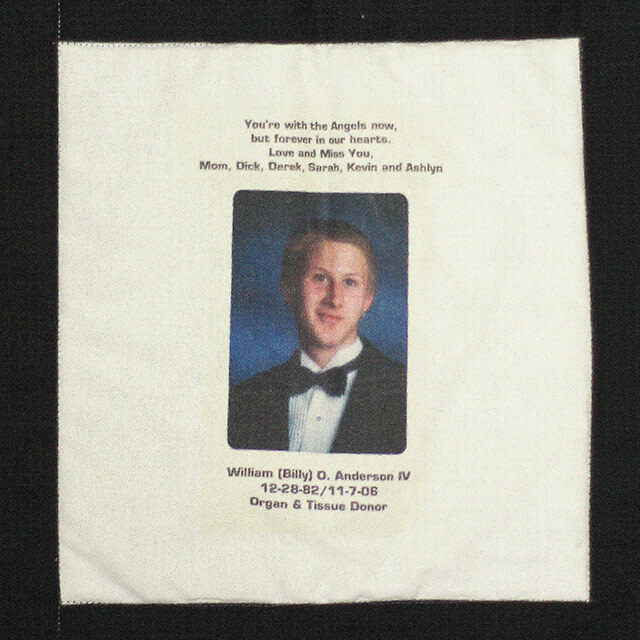 This quilt square is to honor my son Billy Anderson, who died four days following a car accident on 11/7/2006. 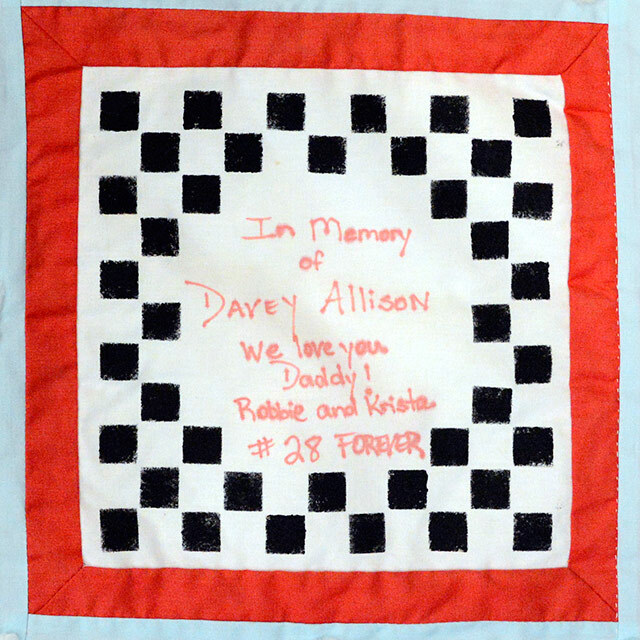 Through organ donation he continues to live on in other people and give me something to look forward to by receiving letters from the recipients and knowing they are doing well. I share my story and letters with others in hopes to inspire them to give when the time comes. Cody was a senior at Fayetteville High School. He enjoyed spending time with his friends riding dirt roads and finding an occasional mud hole. He loved to hunt and fish but he had a real passion for hunting. 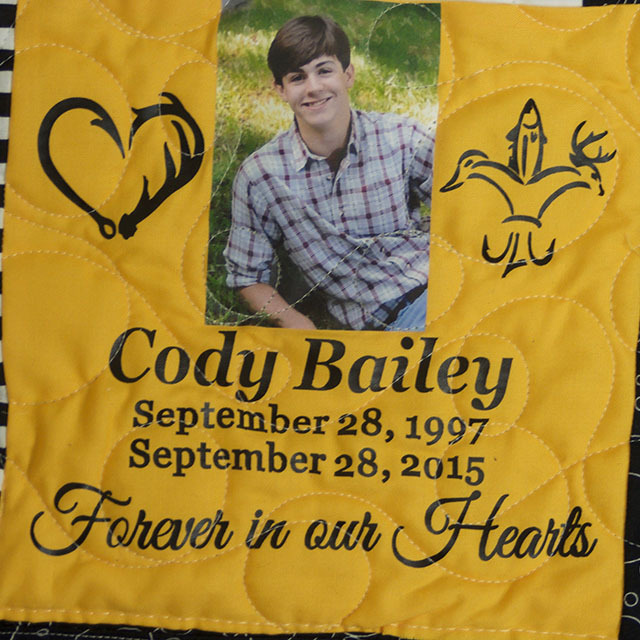 Cody was very sweet and kind hearted and loved his family as much as we loved him. We are so proud of the young man that he grew to be. We will always love and miss him dearly. 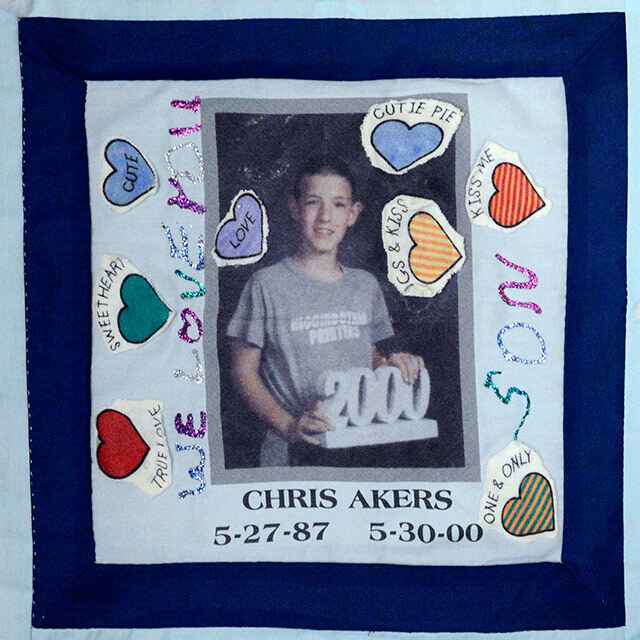 The picture of Cody’s quilt square is one of his senior portraits that were taken just a few weeks before his accident. 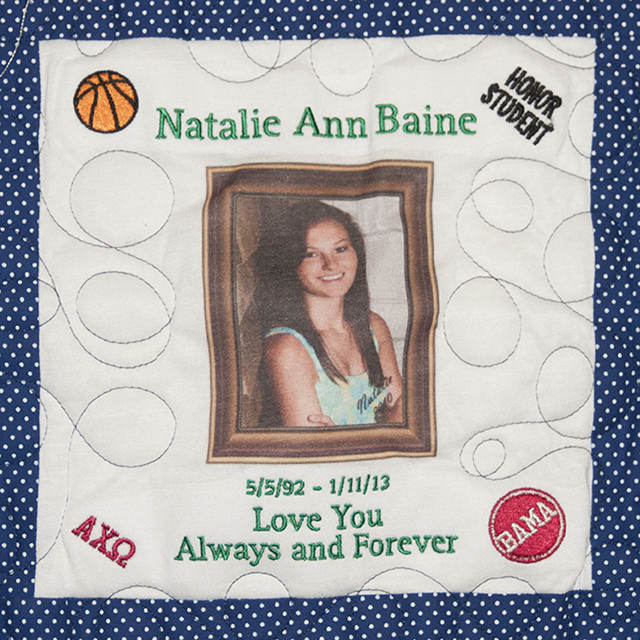 This quilt square for Natalie Baine was designed to show how beautiful she was both inside and out. Natalie had a heart of gold and a smile that would light up a room. Natalie was an honor student throughout her entire academic career, including The University of Alabama where she was selected as one of 25 students to study Accounting abroad for the University. 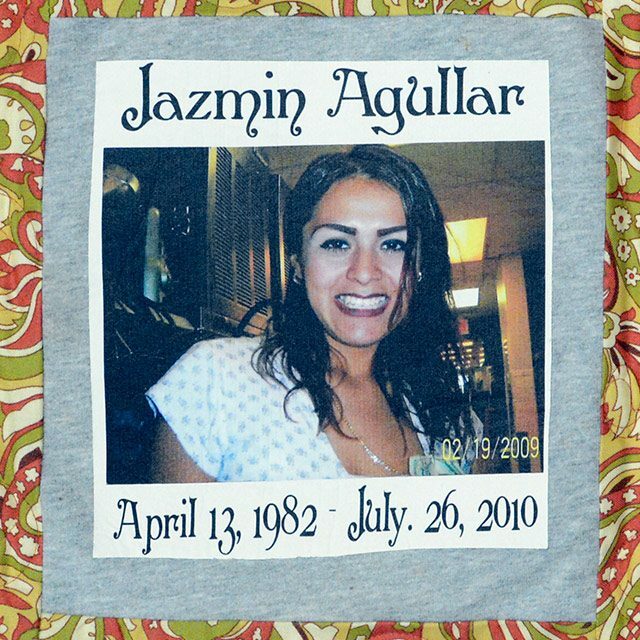 She was a member of Alpha Chi Omega sorority. She was also an athlete- a basketball player where she holds the high school record of 111 starts on a Varsity team for any sport at the school. Natalie loved her family, her friends and life itself. Natalie continues to give life to others through her decision at 16 to be an organ donor. Now her legacy lives on. May God keep his arms around her until we meet again. Mirandasue was a very loving person and could love you unconditionally. She had a great relationship with the Lord. 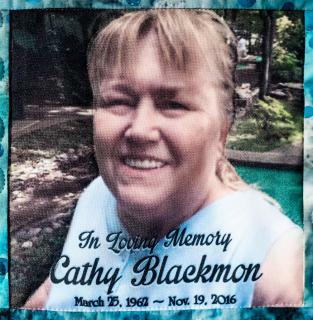 She loved to play sports and loved her high school. She cheered win or lose with her whole heart. I chose her team mascot and colors to represent her. She led a drug free life and ate as healthy as she knew how. She died of a brain aneurysm. She was very high energy and always could do anything she put her mind to. 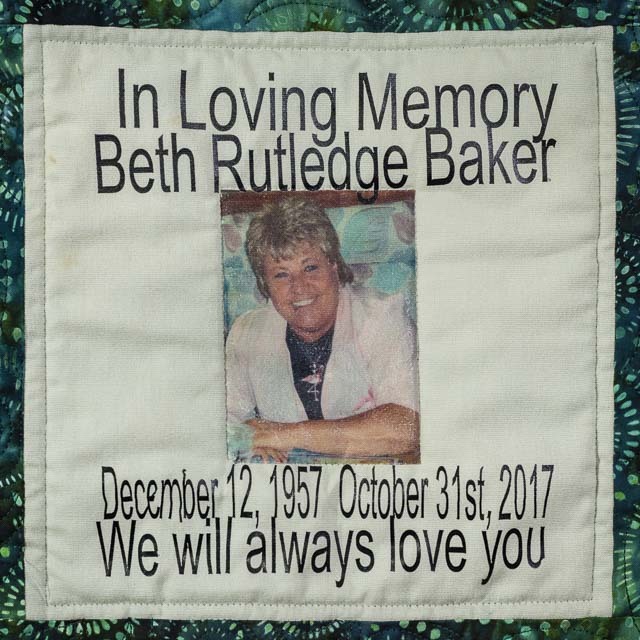 She was a great daughter, daughter-in-law, wife, granddaughter, sister, mother, aunt and friend that anyone could dream of having. Our beloved daughter, Chelsea, died suddenly at age 9. 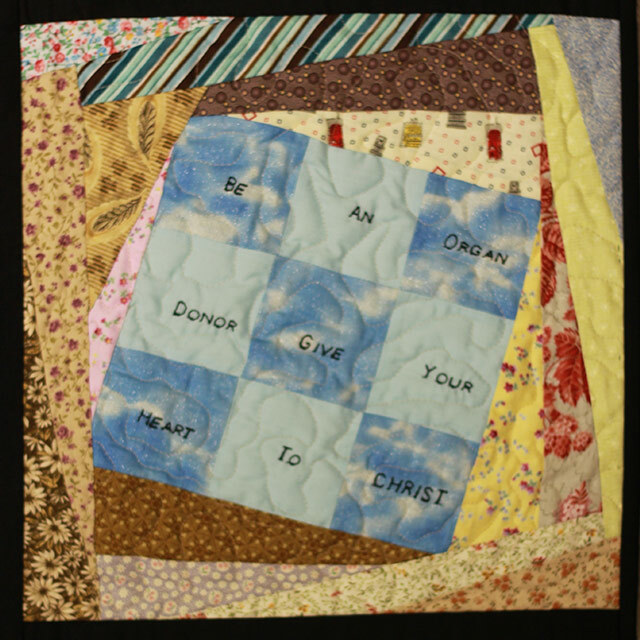 We have taken great solace in the knowledge that four people were given another chance at life from her organ donation. 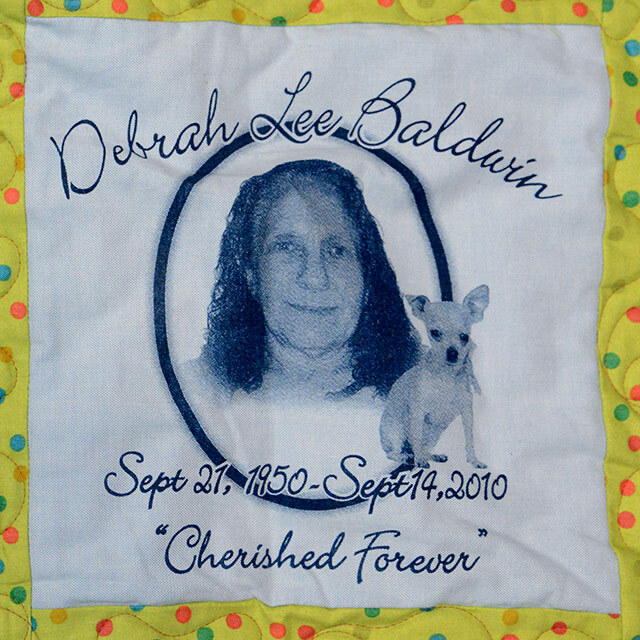 The photo for the quilt square was Chelsea’s favorite school picture. The purple monkey material is leftover from Chelsea’s favorite night gown. 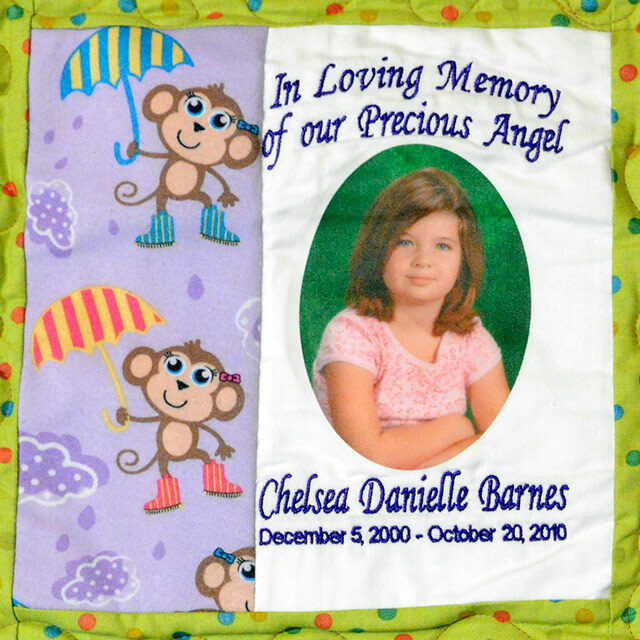 Though Chelsea’s life was short, she was an expressive, loving child. 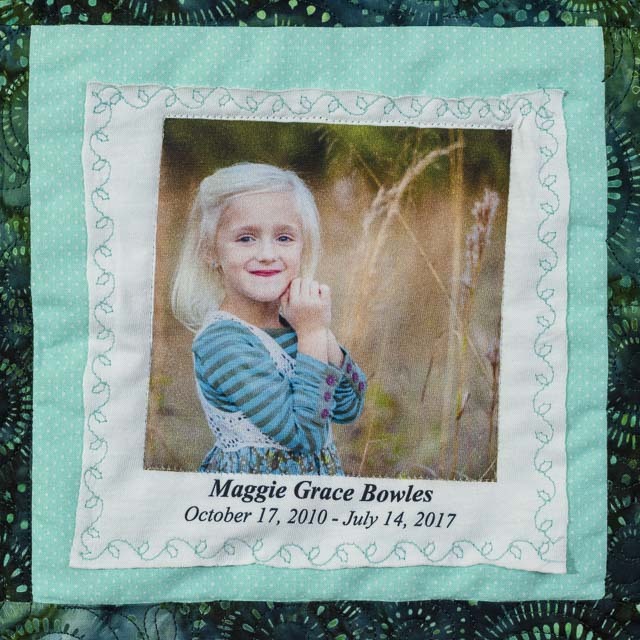 She loved life, she loved her friends and, most of all she loved her family. 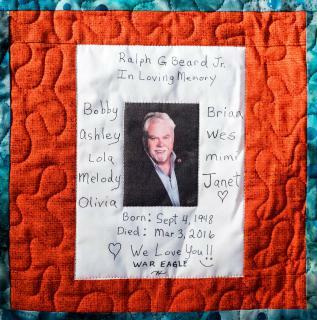 Our quilt square was designed for the job he had and loved for 38 years. 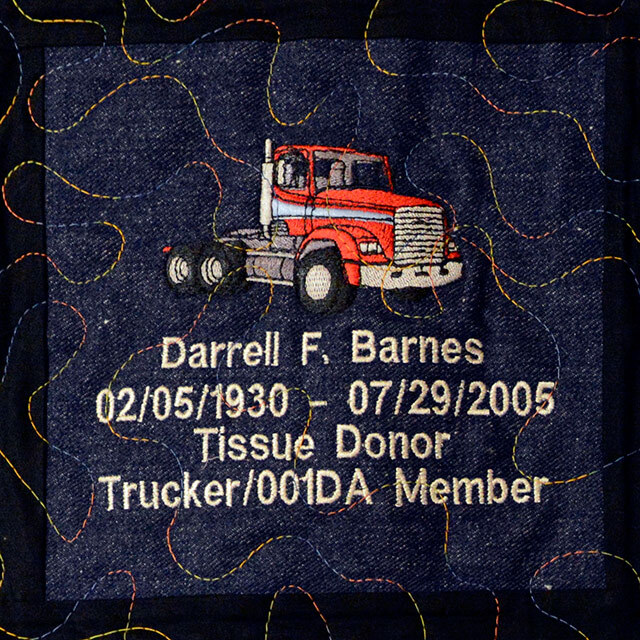 He was an O.O.I.D.A (Owner, Operator, Independent Drivers Association) member. He loved loading and unloading those “big rigs” best of all. He was my beloved husband for 47 years. 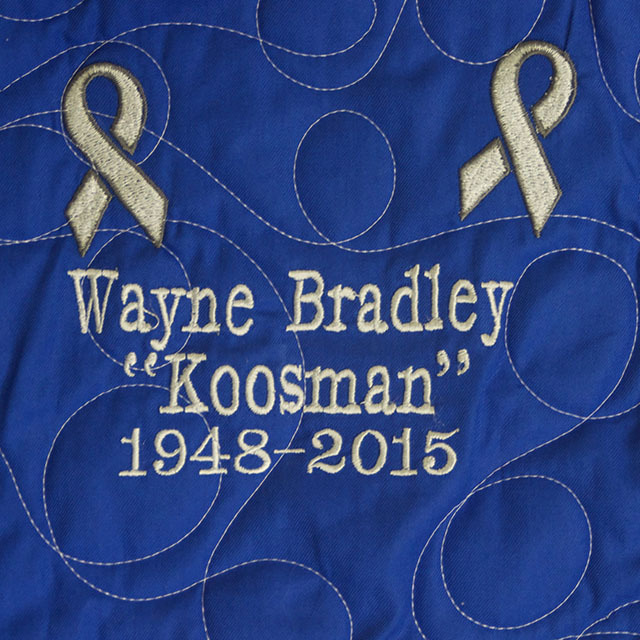 Father of one son, who is also a semi-truck driver, three daughters, ten grandchildren and six great grandchildren. He was extremely very proud of his family. We are very proud to know his wish was to be an organ donor. 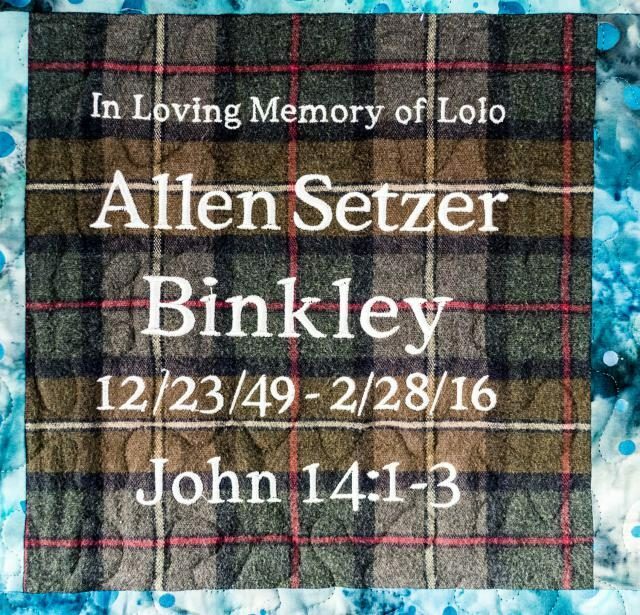 Son, you decorated our lives and gave us a reason for living, you were our joy. 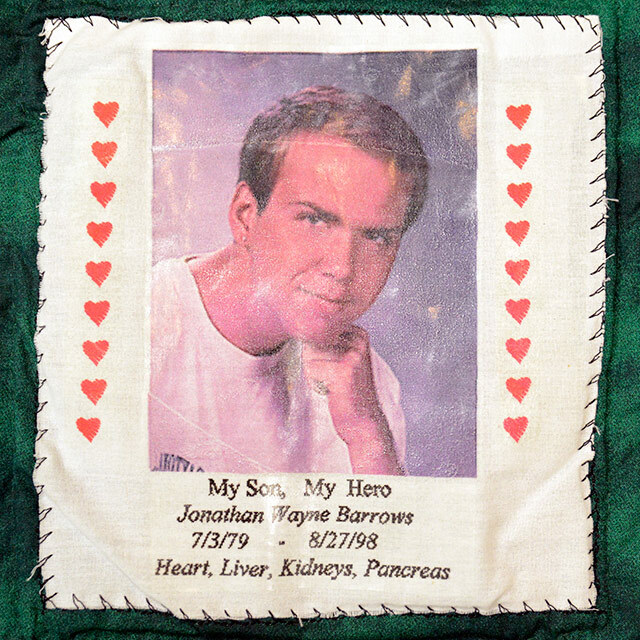 You gave your life to protect society, then you gave your organs to save many. Now you are our hero. 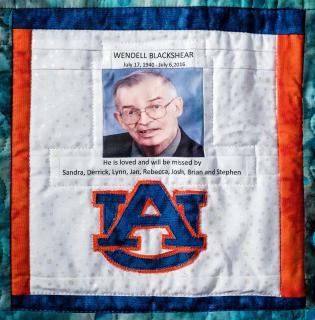 Wendell loved Auburn football. He attended games until he could not due to the progression of his Parkinson’s disease. He also loved spending time with family and loved ones. Wendell also loved bowling, playing golf and putt-putt golf. 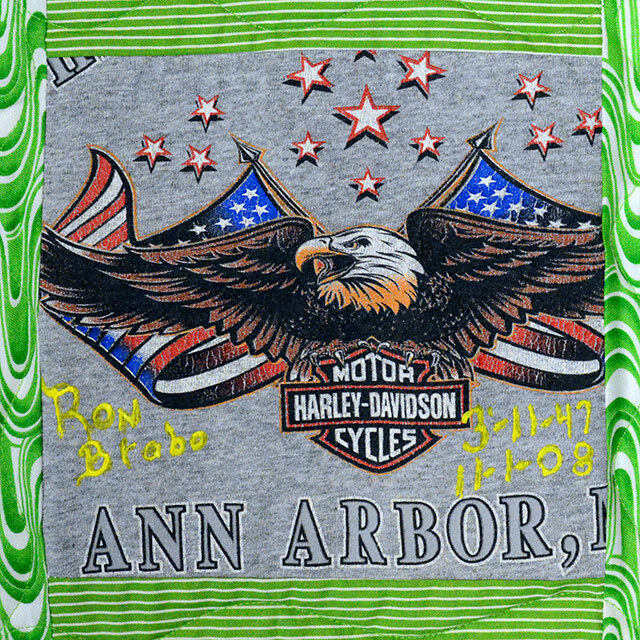 Jimmy Noel Blazer was the second of four sons born to Howard and Ruth Blazer. 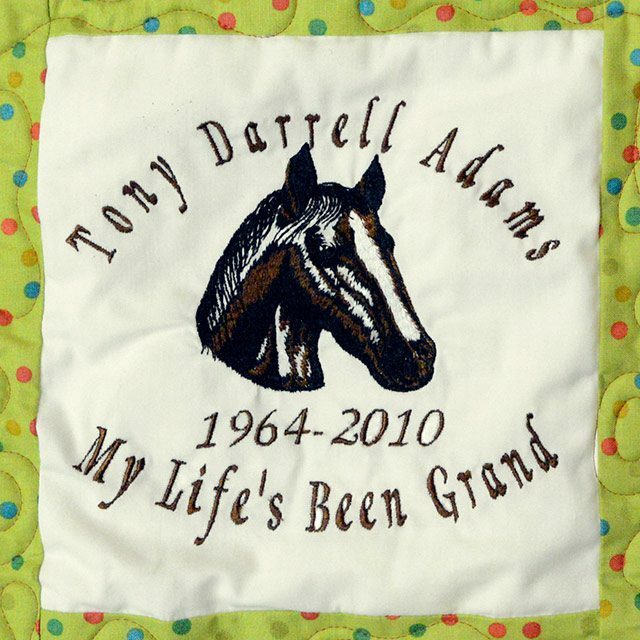 He was born in Florence, AL on June 26, 1959, and died in Troy, AL on December 15, 2008, at the age of 49. He is survived by his parents, brothers, Tim and Joe, daughters, Leslie and Savannah, and granddaughter, Jada Sierra. Jimmy was preceded in death by his brother, Phillip. 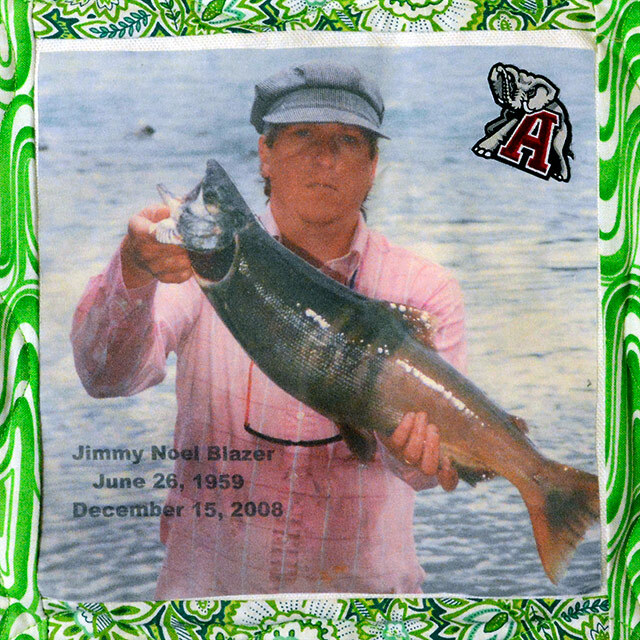 Jimmy loved to fish and ALABAMA football. 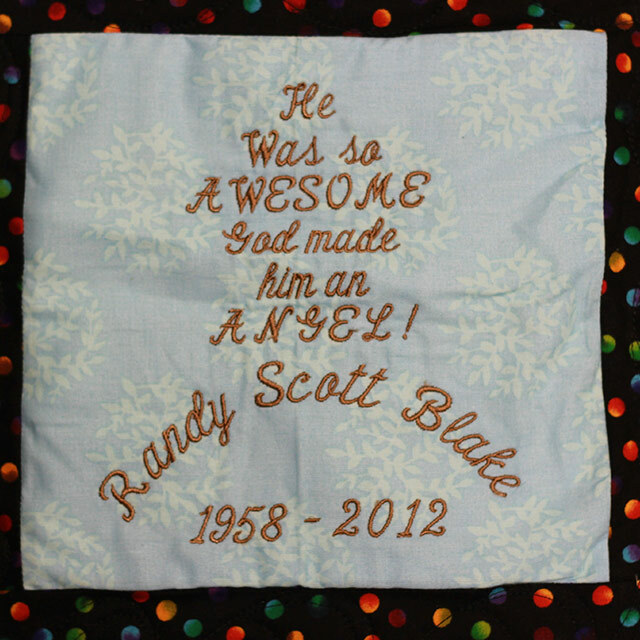 The picture on his Quilt Square is a favorite of his family. It was taken in 1988 at his favorite fishing hole on the Russian River, Alaska. 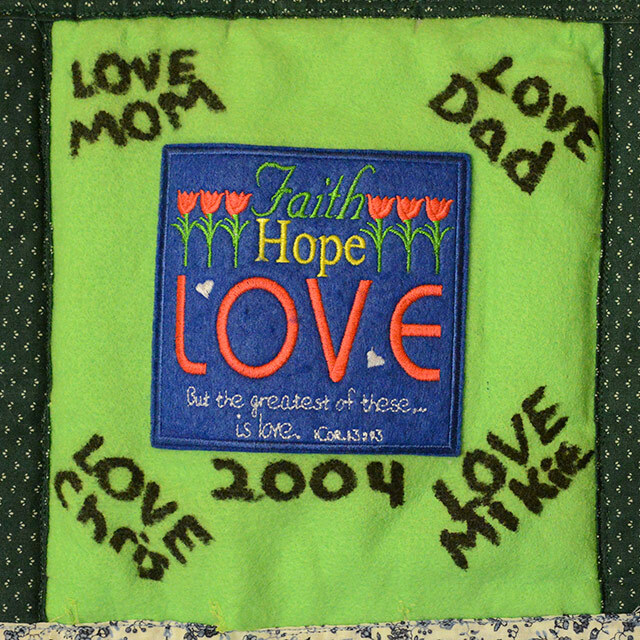 Chris’Quilt Square: The green is from his work shirt, he was a welder, so it had some holes burned in it. The yellow shirt was mine. I needed to be close to him forever, this was my way of doing it. 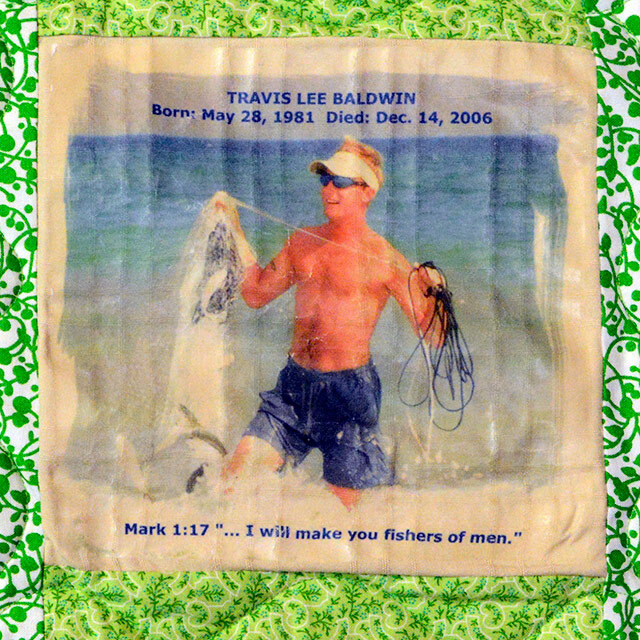 The center round is from his every day play shirt- he loved to fish and hunt, so I see him riding into the sunset fishing with God. P.S. 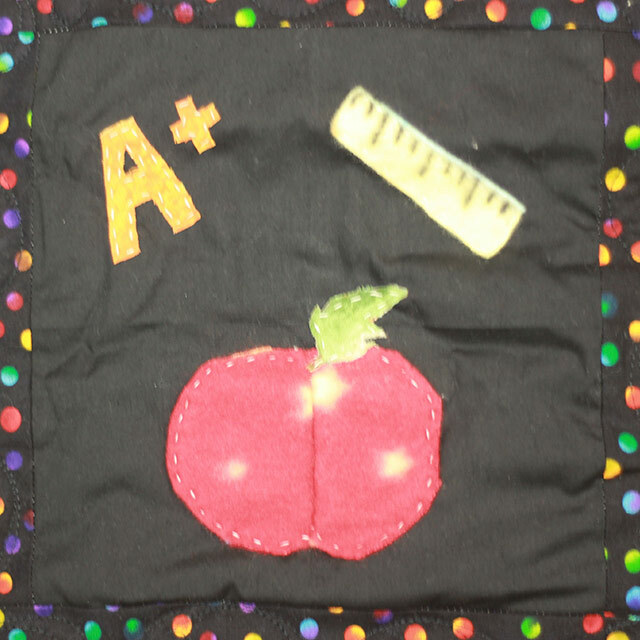 : The Quilt Square is not perfect. Chris was not. Our son, my brother Austin had love of life with a smile you’d never forget. His love of hunting, fishing and a true talent with his hands, has earned Austin one of God’s best carpenters in heaven. Our family never realized just how fragile life is, but yet when your loved one is called Home, and to know Austin’s life continues on in others, is another gift from God. 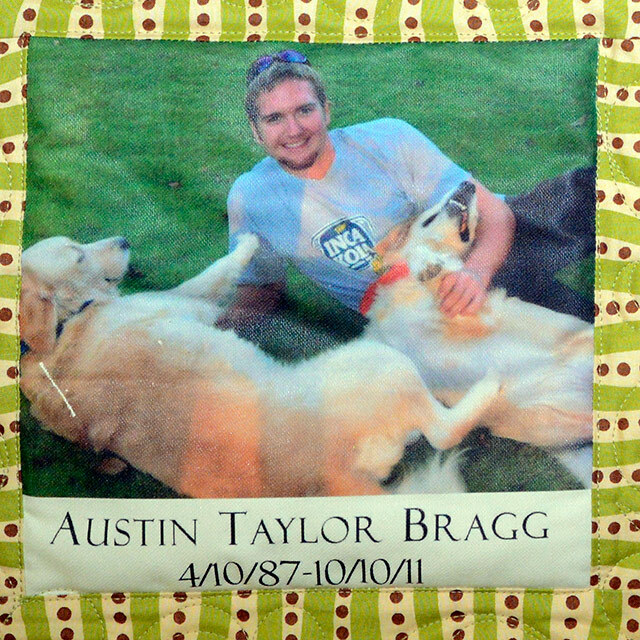 The quilt square was a picture of Austin and our golden retrievers. Austin asked his sister to take this picture a few weeks before God called him home. 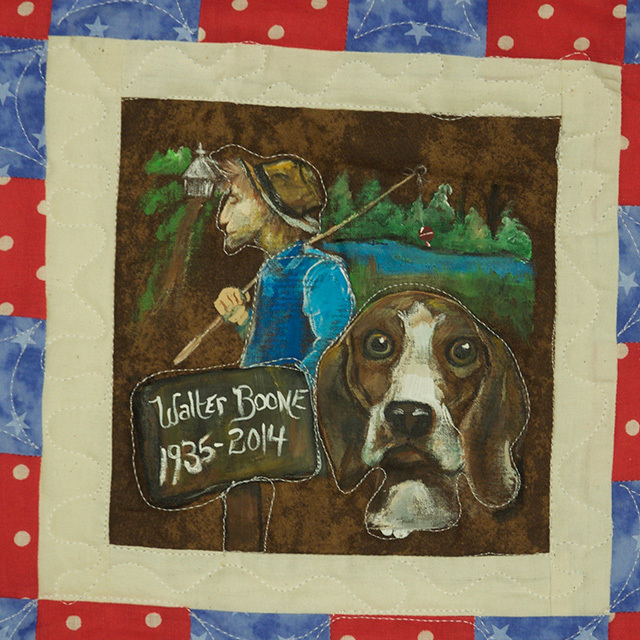 This quilt square truly represents our Austin, our son and my brother.